What Are Satmar Girls Made Of? 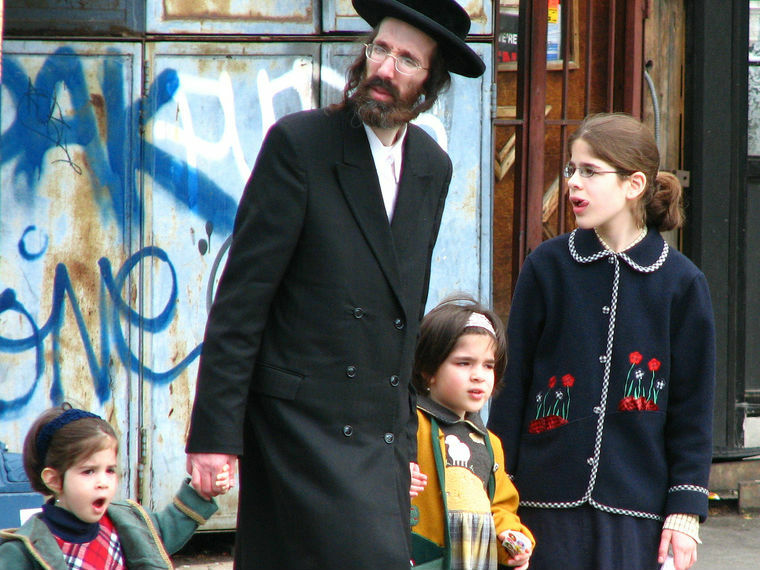 Satmar family in Williamsburg, Brooklyn, where Deborah Feldman grew up. Courtesy Myshi via Wikimedia Commons. If Charles Dickens had been Jewish and lived now, perhaps he could have come up with Deborah Feldman's childhood. Born into the Satmar Hasidic Jewish community, her mother left the group soon after Deborah was born, and her father was too feeble-minded to care for her. Raised by her grandparents, Deborah shared a love of reading forbidden texts with her grandmother, which sustained her during her abusive and stifling youth. Perhaps most shocking was that as a woman, Deborah was not even supposed to read the Torah, the Jewish holy book that supposedly contained all the laws that governed the life of the Satmar Hasidim. Not allowed to graduate from high school, Deborah was married off at 17 into a highly dysfunctional union and had her son at 18. Shortly after, she realized that she could no longer keep up the ruse of the nice Hasidic girl and got a divorce with primary custody of her child. Unorthodox, Feldman's first memoir, ends with her entering Sarah Lawrence College. Exodus, her second, is not as strictly linear: it wanders, much like Feldman herself, in a series of essay-like chapters. Feldman, no longer a Satmar, tries to come to a new understanding of her Jewishness. She is also trying out her new freedom, traveling the United States to see friends and the places mentioned in the books she has read. This book is more comic, including hair-raising adventures with conservative Christians in Texas. Feldman also goes to Europe to trace her grandmother's far-flung route through and after the Holocaust. There she realizes both that Europe feels more familiar than most of the United States, and that anti-Semitism is far from dead. Feldman also gets involved in long-distance relationships, not quite ready to let someone be close to her in all ways. Frankly, it's a miracle that Feldman can function at all, let alone write two riveting memoirs that do not drip with bitterness. Part of the appeal of Unorthodox is a vivid look into the daily life of a highly insular community and the strength it takes to leave it all behind. Exodus is a story of a young woman coming into her own. I recommend reading Unorthodox first because Exodus will then make more sense and you will realize just how far Feldman has come. The meaning of the name Deborah in Hebrew can mean "woman who speaks." You will be so glad Deborah Feldman has found her voice.